Have you been searching for an experience like no other? 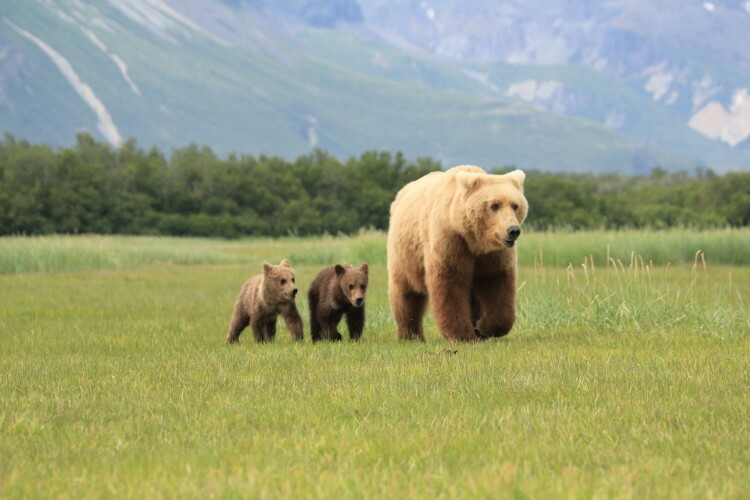 Look no further, Alaska Bear Viewing offers a safe, expert and fun trip into the Alaskan wilderness to see brown bears up close and personal in their natural environment. We are ranked #1 of outdoor activities in Alaska (Tripadvisor.com) come see for yourself 2015 dates are filling up fast so book your trip today! Katmai was declared a national monument in 1918 in hopes of protecting the region surrounding Mount Katmai and the Valley of Ten Thousand Smokes. There are more than 18 volcanoes through the park of which only 7 are active. On a clear day viewers can plan on seeing at least 10 of these awe inspiring volcanic mountains. Today all 4,000,000+ acres of the park are home to approximately 42 species of mammals including red fox, bald eagle, wolf, lynx, river otters, caribou, moose and it is estimated over 2,000 bears. 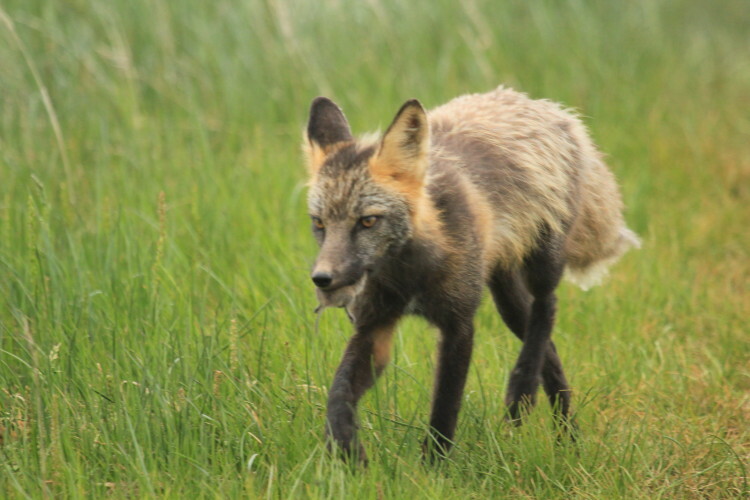 This red fox caught a midday snack and proudly shows it off to a lucky group of adventurers! Spring brings new life to Katmai. While hibernating a pregnant sow will give birth to cubs between winter and early spring . Cubs are generally born in pairs, they are blind, hairless and weigh less than one pound. Spring cubs are very small and must rely on their mother completely for protection and nourishment. In the first summer the cubs will continue to nurse as well as starting to eat some solid food. The cubs have an excess of energy and play almost constantly. Bear cubs In Katmai will typically stay with their mothers for 2-2.5 years before being “kicked out” and starting their independent adult life. A commonly asked question; Whats the difference between Grizzly Bears and Brown Bears? Technically all grizzly bears are brown bears, but not all brown bears are grizzly bears. Habitat and diet are two of the major differences. 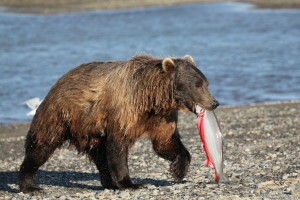 Brown bears generally have access to coastal food resources such as the salmon runs in Katmai, compared to grizzly bears who live further inland and rely on hunting larger pray. An experienced adult brown bear can catch and consume upwards of 30 salmon each day.